The two spinners of India team Yuzvendra Chahal and Kuldeep Yadav has made Proteas think of their strategy as South Africa has already lost their last two matches played against India in the last couple of days.This was a brief of previous matches of India Tour of South Africa 2018. 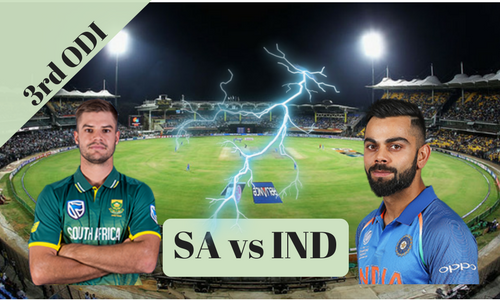 This Post is to provide you a detailed analysis of Today Dream11 Fantasy Cricket Prediction of IND vs SA 3rd ODI. We will be analyzing all the aspects of the match like what astrology has to say about the match prediction, Playing Condition, the Recent form of the players, likely playing 11, head to head stats, pitch report and what experts have to say about the best team for dream11. Match: India Tour of South Africa, 2017-18, SA vs IND, 3rd ODI. Average First inning Score is 233 runs. Average Second Inning Score is 186. Highest total on this ground was 367/5 in 50 overs by SA Vs SL. Lowest Total on this ground was 43/10 in 19.5 overs WI vs PAK. Newsland pitch is spinner friendly pitch and it will support the batsman too. The last match played here was Sri Lanka and South Africa. RSA have managed to score 367 runs on this pitch but the scenario will be different in this match as three main players of SA is not playing. According to the weather forecast, there is no chance of rain so we can enjoy the full match. The temperature is expected to be 28 degree Celsius and 58% of humidity. Virat Kohli (c), Shardul Thakur, Ajinkya Rahane, MS Dhoni (wk), Mohammed Shami, Hardik Pandya, Rohit Sharma, Axar Patel, Shikhar Dhawan, Kuldeep Yadav, Bhuvneshwar Kumar, Shreyas Iyer, Jasprit Bumrah, Yuzvendra Chahal, Dinesh Karthik, Kedar Jadhav, Manish Pandey. Heinrich Klaasen (wk), Farhaan Behardien, Jean-Paul Duminy, Lungisani Ngidi, Khaya Zondo, Andile Phehlukwayo, Chris Morris, Imran Tahir, Kagiso Rabada, David Miller, Tabraiz Shamsi, Hashim Amla, Aiden Markram (c), Morne Morkel. It is almost confirmed that India will not change the Team. Virat Kohli (c), Ajinkya Rahane, MS Dhoni (wk), Hardik Pandya, Rohit Sharma, Shikhar Dhawan, Kuldeep Yadav, Bhuvneshwar Kumar, Jasprit Bumrah, Yuzvendra Chahal, Kedar Jadhav. Quinton de Kock will not play as he is injured. Aiden Markram will be open for RSA team and Heinrich Klaasen will wear the gloves and will take care of the middle order. There is a chance of Andile Phehlukwayo to play in the 3rd ODI in place of Tabraiz Shamsi as Playing two frontline spinners is creating trouble for South Africa. Heinrich Klaasen (wk), Jean-Paul Duminy, Hashim Amla, Aiden Markram (c), Khaya Zondo, Andile Phehlukwayo, Chris Morris, Imran Tahir, Kagiso Rabada, David Miller, Morne Morkel. MS Dhoni: Dhoni has scored 4 runs in the 1st ODI and he didn’t get the chance to show his helicopter shot in 2nd ODI. There is less chance of seeing MSD batting in the 3rd ODI as well. He has a strike rate of 59.12 and an average of 51.57 in ODI. He has contributed 8.5 points in the first match and 6 points in the second match. Heinrich Klaasen: Heinrich has replaced De Kock and is a middle-order batsman. Last ODI he played was against Warriors and he scored 26 runs. Klaasen has a strike rate of 90.11 with an average of 35.36 in List A cricket. Note: Try to select Heinrich Klaasen. If you are playing with more than one team you can go with Dhoni also. Virat Kohli: Kohli has scored 112 and 46 runs in last 2 matches. He has a strike rate of 91.76 and an average of 56.37. In the 1st match He contributed with 71 points and in second match he contributed with 28 points. Hashim Amla: In this series, Amla is out of form but he can destroy his opposition any day. He has scored 16 and 23 runs in the last two matches. If we look at his dream11 point contribution, he has contributed 10.5 points and 15.5 points in last 2 matches. Hashim strike rate is 89.15 and an average of 50.82. Rohit Sharma: Rohit has not performed well in this series. He has just scored 20 and 15 in the last two matches. His strike rate is 87.0 and an average of 44.85 in ODI Cricket. If we look at his Fantasy cricket points, he has just contributed with 14 and 11.5 points. Shikhar Dhawan: Dhawan is in good form. He has scored 35 and 51 runs in last 2 matches. It was his bad luck that he got run out in first ODI. His strike rate is 92.84 and an average of 45.32. He has contributed with 22.5 and 34 points in last 2 games. Aiden Markram: Markram is a player who opens for his team but for Proteas, he was batting third down. In 3rd ODI Aiden will open for South Africa so he has a good opportunity to sore and bat for long in this limited over cricket. His strike rate is 90.22 and an average of 27.67. He has contributed with 10.5 and 6.5 in the last 2 matches. Khaya Zondo: Zondo has scored 25 runs in the last match. His strike rate is 55.56 and an average of 25.0. He has contributed with 14.5 points in the last match. Note: Choose players from the above list and try to make the combination of players from the above players. Pro Tip: Try to select more players from SA as Indian All-Rounders will get less chance to bat. Note: Try to select Imran Tahir, Yuzvendra Chahal, and Kuldeep Yadav as the pitch will support the spinners. Astrology and the current form of India say that India will win the match and if we look at stats of last two matches India will easily defeat South Africa. It is predicted that RSA will win the toss and they will decide to Bowl first as they find difficult to face the double spin attack against India. If India wins the toss they will also decide to bowl first and will love to stop SA with a low total. Conclusion: This is what we have for Today Dream11 Fantasy Cricket Prediction of IND vs SA 3rd ODI. We will love to hear your expert opinion in the comment section.